It is lunch time in sunny Naples, Florida. Genesis Tucker lounges in the living room watching TV on her flat screen with some of her housemates. Together, Genesis and her five housemates live in a group home. She finds companionship with her housemates; she enjoys watching Netflix movies and going shopping with them. A Californian by birth, her family moved to Miami, Florida when she was only two weeks old. When she was 13, her family moved to Hernando, Florida. While in Hernando, Genesis completed two degrees in Education and Early Childhood Education at the College of Central Florida. Genesis left her parents’ house for more independence at the age of 23. She moved to a group home in the quiet Central Florida town of Crystal River. She later relocated to a group home in Naples to be closer to her parents – this is where she lives today. Although she was able to walk early on, Genesis suffered knee injuries from two falls and is now in a power chair – but her immobility does not stop her – she takes part in scheduled trips and activities arranged by her group home. 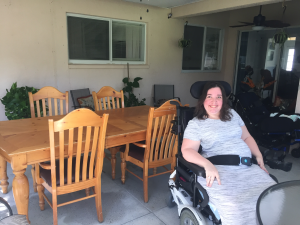 She also likes to go out on her own with the services provided by Collier Area Paratransit, a transportation service for people with disabilities provided by Collier County Transit. Genesis rides the paratransit bus to Humane Society Naples where she volunteers. Genesis loves the opportunity to spend time with the animals at the shelter, especially the cats. Someday Genesis would like to adopt a cat of her own. 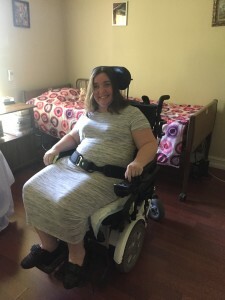 accessible – she is able to move around her entire home independently using her power chair. Ramps and accessibility modifications allow Genesis to be as independent as possible. Genesis is passionate about creating hand-made dolls and writing stories about them. She is working on a business idea that would allow her to earn money through this creative past-time. She loves the idea of working in the comfort of her home and is taking steps to start a microenterprise. She hopes to sell her dolls and stories online in the near future.